Welcome to the Proxy Project! The Proxy Project is a public health, scientific effort aimed at ending child abuse through research. Munchausen Syndrome by Proxy (MSbP) abuse is the most deadly form of child abuse. Research studies suggest that 10%-30% of MSbP victims die in childhood. Since 10-30% of MSbP victims die, this means 70-90% of them survive. Yet, there has only been one study to date on adult MSbP survivors. Use the knowledge gained in this effort to reform the health care system to engage in prevention of and early intervention on MSbP behavior. MSbP abuse has also been called “medical abuse” because the defining characteristics of MSbP include a caregiver, usually the mother, either faking an illness in her child, or actually inducing one, for the purpose of fooling doctors and tricking them into either giving or withholding diagnostic tests and clinical interventions. There are other characteristics of MSbP behavior, such as physical, mental, and sexual abuse, but this particular type of medical abuse is the characteristic that sets MSbP apart from other severe child abuse. The medical abuse in MSbP is what normally causes the deaths in victims who do not survive. Deaths from MSbP could not happen if the health care system stopped being repeatedly tricked or fooled. With today’s electronic medical records and health insurance debates, it is shocking that most MSbP behavior continues undetected right under the nose of the medical system and is never stopped, even though it is obvious to come clinicians and it is expensive to insurance. 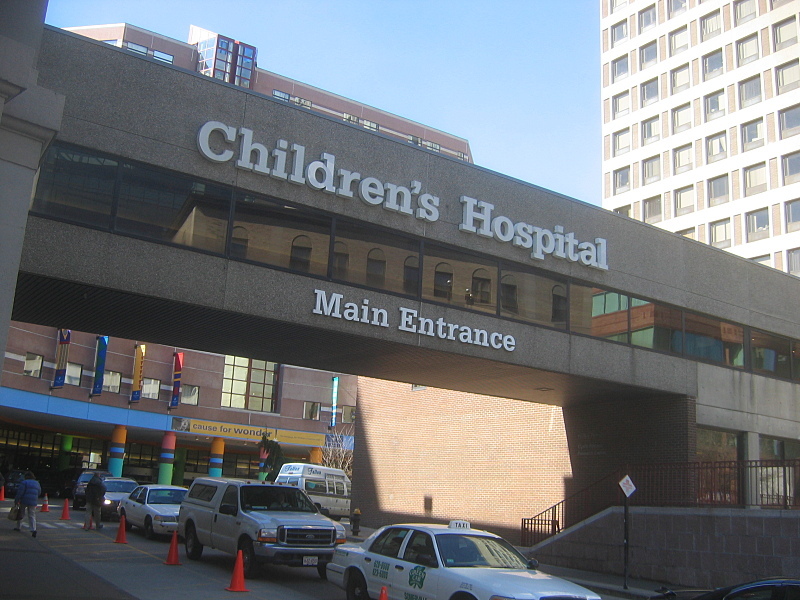 Photo of Children’s Hospital in Boston by Joseph Barillari. Photo of children by Monika Wahi. I’m interested in reading more..no verdict yet.. So far information looks great.! Thanks for your comment! One piece of good news – we are just finishing up a book chapter on Patient-centered Approaches to MSbP in the Healthcare System. (That’s why our blog has been a little slow the last few months.) We will post more on our blog about the book chapter so you can access the chapter when it is done. We intend to publish more, both in the scientific literature and in our blog, so stay tuned! So A***, do you agree that in large measure, ADHD is the invention of FixMyKid Doctors? Some of them use drugs, but some do not. Right now these two groups are competing for share in the FixMyKid market. Of the second type, we’ve all seen their ads. They clued me into something critical, one of the defining characteristics of the middle-class family is that it hires its own private practice doctors. It does not use public agencies which serve the poor. So it is not just the pedagogy and child development manuals which characterize it, it is also the use of all sorts of doctors. And as I see it, mostly it is just that the parents want to be right, as this is why they had children. Do you agree with me, that these doctors are routinely seeing kids who show sufficient evidence to warrant suspicion of severe emotional abuse, and that likely each one of these hoax ailments like ADHD is really just an excuse for severe emotional child abuse? And so do you agree with me that these doctors should be made to comply with the letter and intent of our federal mandatory reporting law, or face prosecution? Of course you know that that would be the end of the FixMyKid industry. Does the thought of some of these doctors being charged with felonies, and the entire FixMyKid industry being plowed under, arouse any particular feelings in you? You know that unless forced to, the doctors would never report, and that it has always been this way. The reason we have mandatory reporting laws is to prevent any type of doctors or others who work with children from becoming accomplice child abusers. This is the original intent. I would say that as it stands now, going by the letter of the law, a doctor who sees a child who is clearly displaying signs of extreme emotional abuse, but does not report, is committing a felony. And this applies whether they treat the child or not. I know someone with our county hospital and she teaches the class on mandatory reporting. She says, “You report *EVERYTHING*”, that is they err on the side of compliance. And you don’t know, your small complaint could be the one which, added onto others, prompts action. Thing is, the private practice doctors seem to take a much lighter attitude towards reporting. Their business model requires that the parents always be held blameless. And often they make this interpretation clear in their promotionals. Otherwise they would get no patients. The middle-class family has always revolved around hiring doctors. And so doctors seem to be involved in a majority of middle-class child abuse cases. Our federal law since 1974 was intended to prevent this. But here we have this ADHD hoax, and it seems to be the creation of the FixMyKid doctors. One problem is that there is vagueness in the mandatory reporting laws. And as it stands today, the authorities already get more complaints of suspected child abuse than they can do anything at all with. But the intent of the law is that doctors cannot become accomplice child abusers, and that if they do they are committing a felony. You see my point, that if the doctors actually had to comply with the law, then this industry would vanish, as would all of its hoax ailments and the drugging of children. Paul, the issue of medications in MSbP affected my family, allowing a death that did not have to be. Support and sympathy to you, and to your son. I am the father of a 24 year old victim of Munchausen Syndrome by Proxy. His mother, now married to a psychologist has spent most my sons life inventing new reasons to seek medical and psychological care for him. He is still with me as he has been every weekend of his life so I know my son and know that most of this care has been unnecessary and much of it especially the psychiatric care very damaging to him. I have been unsuccessful in finding a lawyer willing to challenge the small New England state we live in concerning his denial of civil rights. Despite the fact that he has never hurt anyone or committed a crime he is still being forced to take multiple psychotropic medications based on his mothers and step fathers testimony about his behavior. They started anti psychotic meds when he was 17 and late in his 18th year had a civil commitment hearing that continues to this day founded on his behavior while on psychotropic medications. He started hearing voices about one and a half years after being put on Risperdal for the treatment of an irritable disposition. Dopamine super sensitivity anyone? Now the higher the doses the worse the symptoms so now we have benzodiazepines thrown in the mix. All with the unquestioning endorsement of state supported psychiatric community that professes the meds can never be stopped. If he had robbed a bank or shot someone he would still have rights but because of being the victim of Munchausen Syndrome by Proxy he has no rights and will not live a long or happy life. Munchausen Syndrome by Proxy is real and very few professionals are aware of it or know how to handle it. It has cost the company I work for and our privately funded insurance hundreds of thousands of dollars over the last twenty four years. Before long it will cost my son his life. I am so sorry to hear this story. I can really understand your frustration and I’m so sorry you have to watch this as a bystander and you cannot intervene. It would be truly awful if nothing could be done about this. My dad never tried very hard to intervene, but I know I have tried to intervene on my younger brother (an adult in his 30s) but he is brainwashed and won’t listen to me. You are a wonderful person for trying to intervene. If you would like, please feel free to contact me (Monika) at proxyproject@vasantahealth.com. Maybe we can brainstorm a little. This is a horrible story! I am so sorry for everything you and your son are going through. Unfortunately, I can relate, but fortunately, I escaped from my mother’s clutches eventually. I had the looming threat over my head that she would deem me incompetent, and I could have ended up like your son! It’s terrifying to think. It must be awful to watch this happen, and try to intervene, but no lawyers will take your case. What state do you live in. Here in MA, we have the Disabled Persons Protection Commission (DPPC) for people with disabilities. I’m not sure if an agency like that would be able to help, but I know that they have lawyers and stuff, so maybe that could be a start??? I wish that my father had been as impassioned as you are! Don’t give up! I am so sorry to hear all you and your son have endured, are enduring. I am 36 and have just recently become vocal and more aware of this diagnosis… It has taken me over 20 years to even believe that this has in fact happened to me…. I still have a mother who can’t “function ” when I am well and happy… and sadly I still have that deep rooted “trust ” that she’s always right…. I saw that you are now dealing with benzos and though there are many who need them, I feel compelled to tell you the severity of which they have damaged my life… Not only do they often cause anxiety that wasn’t present they are physically addictive.. the withdrawals deadly if not medically supervised… Of all the “diagnosis & labels” that my mother placed on me so convincingly to doctors, family schools from age 10… I truly believed anxiety was legit (perhaps from years of this “abuse”) but they have actually hurt me… I almost lost my 3yr old son TO MY MOTHER because I decided to get off of Xanax and was hospitalized to do so…. My mother attempted to deem me an unfit mother and the thought of my little boy going through what I had terrified me so much that I left the hospital and now, as my son nears 6, I am still on benzos, living in fear of the possibilities do I try to get off them. Again, this is a new understanding for me, this is actually the 1st time I have ever acknowledged what I have known to be true for decades… often MSbP has rung in my head but I always revert to the same thoughts of how my mother is always “right, so smart and through the eyes of the world has it together “…. Even writing this is producing guilt, thoughts that maybe she was, still is, right. I am in R.I. and don’t know where to begin looking for others who can relate or help me. My father turned a blind eye and I commend you Paul for seeing the reality and advocating for your son. I can’t fathom how my life would be had someone been my voice when I was too emotionally enmeshed to speak. Your son is blessed to have you, please don’t stop fighting …. It’s very common to self-blame, as i know. My dad was a survivor of MSbP, and that pattern of “never his fault” carried over into his relationship with his children. We here at Proxy Project seem to be pretty unusual in specifically addressing MSbP rather than “generic” abuse only. If you think contacting us will help you sort things out, feel free to do so. We’re here.